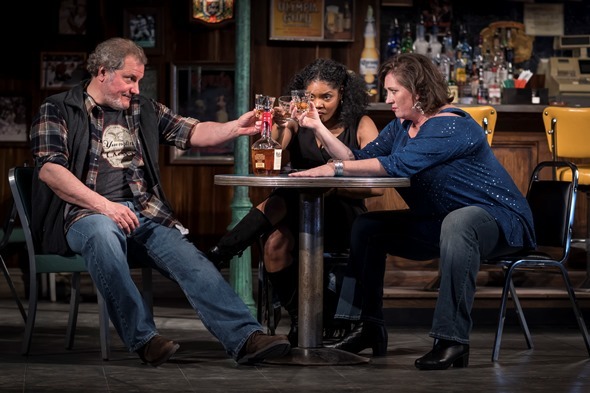 The tragic grandeur of Lynn Nottage’s play “Sweat,” now indispensably on display at Goodman Theatre, resides in its complex truths. 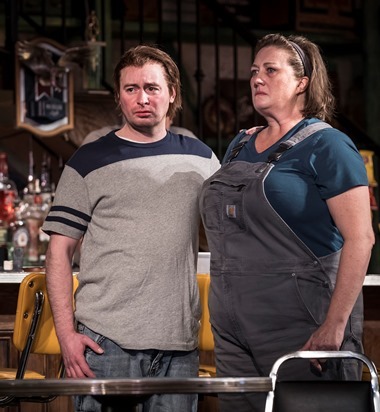 All in one remarkable tumble, it is a play about the vulnerability of the labor class, the crassness of their overlords, the fragility of friendships, the partitions of tribalism and the volatile bond between mothers and sons. Nottage’s contemporary story unfolds in a town where an industrial production plant is the community’s economic core. It seems just about everybody works there. And when not at work, the gang hangs out at a local watering hole tended by, yep, a longtime former employee at the same company. This has been a constant for generations; the plant is one of those eternal verities. Until suddenly it isn’t. The owners have thrown down the gauntlet. They want the union to accept a hefty pay cut, or lose everything as they watch the company relocate to Mexico. The workers strike. In the dead of one night, the company moves some production machinery out of the plant. And changes the locks. And then begins hiring replacement workers – scabs – dirt cheap. Just like that, a way of life is ending, and the affected human beings react in the drastic ways of human nature. In microcosm, the whole ugly situation plays out in the fracturing of close friendship between two workers, two moms – Cynthia, a black woman who has just won a promotion off the floor into middle management, and Tracey, a white woman who had put in for the same job. Cynthia has a college-age son who wants to make something of himself and an ex-husband who gets by on life’s scraps. Tracey’s ex is nowhere to be seen, and her hulk of a son is quite content with punching the company time-clock until he can retire and ease into the sunset. When best friends were forever: Bartender Stan (Keith Kupferer), Cynthia (Tyla Abercrumbie) and Tracey (Kirsten Fitzgerald). Tyla Abercrumbie’s well-meaning Cynthia, caught in the torrent of corporate expediency and her friends distress, offers a poignant foil to Kirsten Fitzgerald’s increasingly angry Tracey. As the screws tighten and the displaced workers look for someone to blame, someone on whom to vent their wrath, Tracey turns on her erstwhile BFF, whom she now sees as a defector to the other side: a traitor. Fitzgerald cuts an imposing, fierce figure, like a beast circling and snarling. If Tracey is threatening, her son (played by Mike Cherry with a potent mix of narrow bravado and crushed hopes) is dangerous. He brings to mind one of the gang members in “West Side Story” who just wants to hit somebody – pow! Doesn’t matter who. But then a perfect target presents itself: Oscar (Steve Casillas), the practically invisible Latino who helps out at the tavern. Oscar becomes highly visible when he jumps at the chance to work at the plant – as a scab. The unspoken ethnic barrier has been lowered. But still, a guy could get killed for that. This is only going to end one way, in violence, and it does. Rage spills over. There’s a baseball bat. Rage turns to madness. Chris (Edgar Miguel Sanchez) lends a sympathetic ear to another episode in his father’s (André Teamer) hard-luck story. Three inviting characters of a quieter sort pass through the spotlight or edge around it. Edgar Miguel Sanchez offers a good-hearted turn as college-bound Chris, a decent kid with his eyes on a better future but who also has time for his n’er-do-well father (André Teamer). He also finds himself at the center of the same storm that catches up his mom Cynthia when things go bad and she’s somehow on management’s side of the divide. Chaon Cross has few lines but a mesmerizing presence as Cynthia and Tracey’s third musketeer, Jessie: a devout drunk always ready to fill ’em up again and party on. 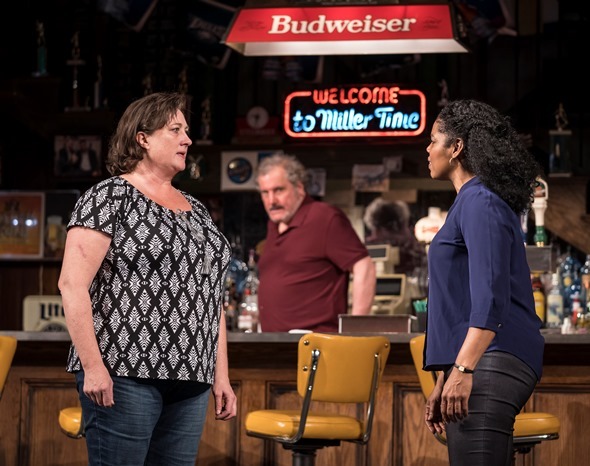 In one hysterical coup-de-theatre, Cross’ inebriated Jessie drifts silently across the barroom floor while others are immersed in a scene, approaches the jukebox and — well, it isn’t a quarter that she drops. To judge from the wave of laughter, not many missed the gag. If you’re going to have an authentic tavern (and designer Kevin Depinet’s detailed set is a beauty), you need a credible bartender. That duty is served to a fare-thee-well by Keith Kupferer, as the onetime plant worker who turned to pulling beers after he got injured on the job. Kupferer’s Stan the barman is a soft-spoken, philosophical guy and a restraining influence when tempers start to rise. But he’s also capable of stepping up. 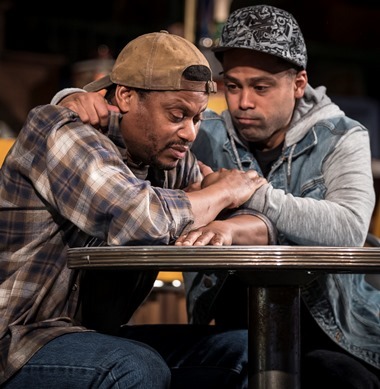 All told, Goodman’s “Sweat” is stellar ensemble theater, another directorial tour de force for Ron OJ Parson, who well may be the most consistently perceptive, imaginative and original helmsman on the Chicago stage.